And the hills are alive… to the sound of chainsaws. 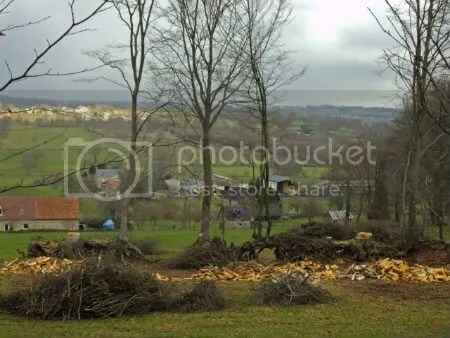 It always feels like – and looks like – January is tree-felling month in Normandy. In Britain – or southern England anyway, since that’s where I know – mature trees, even in hedgerows, are increasingly regarded as something to be enjoyed, cherished and conserved. By order if necessary. In this heavily wooded part of Normandy they’re simply a crop. A slow-growing but very important crop. 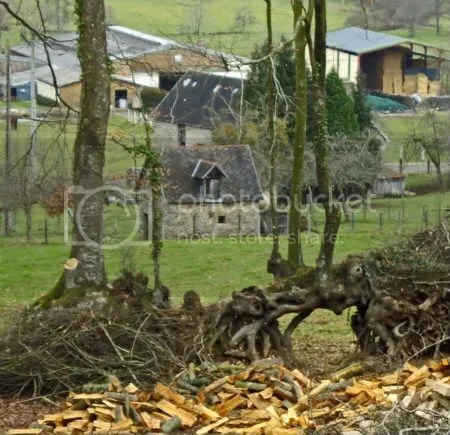 Rural France is still heavily dependent on wood as a fuel for heating. Local landowners and farmers regularly fell mature hedgerow trees, convert them into manageable pieces – and their size depends on the equipment available to move them – then they are left to dry out for a couple of years before being used to keep their own home fires burning or to provide a useful income by selling the wood on to those who don’t have their own source of firewood. Many British people are horrified when they see what appears to be this mass slaughter of hedgerow trees each year. 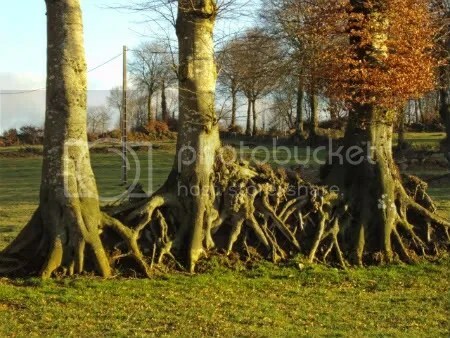 It’s not really like that, of course – the hedges have long been “farmed” this way – look at the root systems. Having watched the annual felling for 10 years now, I can’t honestly say it seems to make any difference to the overall landscape. 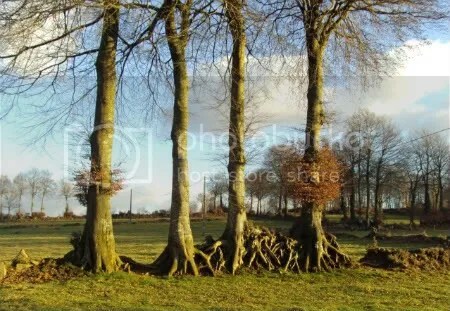 These trees – oaks, beech, sweet chestnut – are enormously forgiving and resilient and simply shoot again from the stump and generally, one or two trees are taken out from a hedgerow; they aren’t all felled. 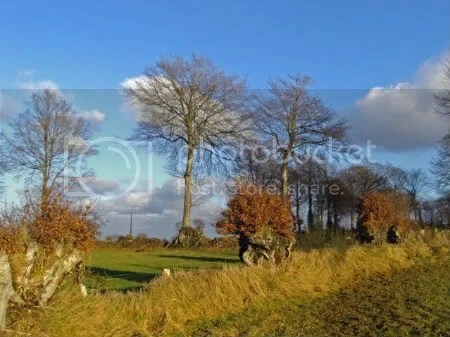 The Normandy “bocage” – the wooded landscape with small fields bordered by ancient hedgerows – is fascinating to look at. It is part of the reason that, after the D-Day landings on 6 June 1944, fighting in this area which is only 80 kms / 50 miles south of Omaha Beach, continued into mid-August. The German tank divisions dug into fields behind these hedges and the Allied advance was seriously hindered by the strength of these hedges – particularly as some of them have enormous boulders embedded in the hedgerows. Short of blowing up a way through some of the hedges, there was no way of making fast and easy progress down through the Calvados countryside. In the photograph above, there are four tall, straight trees edging a field. To the right, there are two stumps from trees that have been felled. They’ll shoot from the stump – it’s extreme coppicing, really – and a main shoot will eventually be allowed to develop into a tree again. The two trees to the right with the incredible root system have probably achieved that size at least twice previously before being cut down. After a few years, one sapling will be allowed to grow straight and tall until it reaches sufficent size. 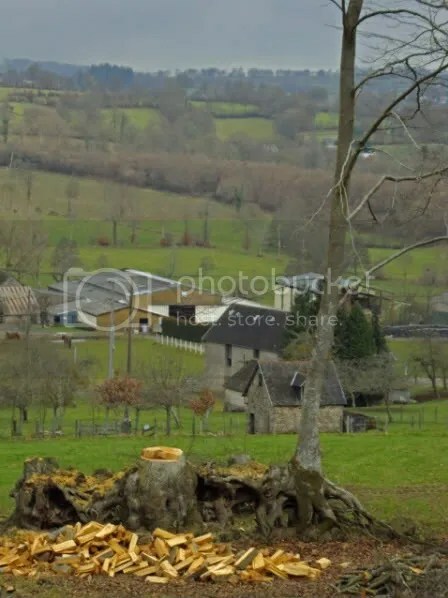 The background of the photo above shows how well-wooded the area is and is why losing a few trees each year doesn’t adversely affect the look of the countryside. Some of the root systems on these ancient trees are remarkable. An additional benefit of this frequent thinning is allowing as much sunlight as possible to reach the fields. This part of France has no obvious “set aside” of field margins. Land is a valuable resource that delivers crops – whether the crop is vegetal or animal. The more sunlight that reaches the edges of the field the better the crop – or grass for grazing – grows.